Although Barcelona has a temperate climate, these days around Christmas season you can ice skate outdoors in the middle of Barcelona. 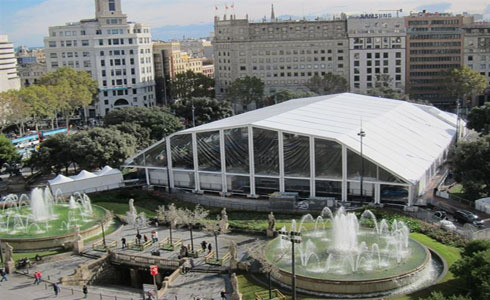 For the third consecutive year, Barcelona has installed a huge ice rink in the middle of Plaça Catalunya, right in the city center. According to the organizers, with an area of ​​about 1400 square meters it is the largest outdoor ice rink in the world. The children’s area this year is twice as big as last year, and the general rink has also grown more meters. To make this possible, the ice rink has been covered with a very big tent that has a pillarless structure. This tent is the same that was used by the Cirque du Soleil this summer for their show in Andorra. The prices for the ice rink will be 7 euros for half an hour and 9 euros for one hour, which includes skate rental. There are special discounts for children, groups, etc. and if you have the Bcn Xmas Card you will have a discount of 50%. All information about schedules and prices is on their web BarGelona, where you can also book the time that you want to skate and this way avoid waiting in the queue, which is most likely to happen again due to the previous years’ great success of the Christmas ice rink.